Photograph and family information courtesy of Alexander. Born: 21st June 1917, Ipswich. Died: 21st November 1943; age: 26; Died of Beriberi due to Malnutrition as a Japanese PoW – at Canu Jungle Camp, Thailand. Residence: 20, Ashmere Grove, Ipswich. Rank: Lance Corporal; Service Number: 5775765. Regiment: The Royal Norfolk Regiment, 4th Battalion – Infantry. Father: Harry Cole, born May 1883, Ipswich. A Watch, Clock & Jewellery Dealer & Repairer. Mother: Lucy Eliza Cole (nee Blake), born August 1882, Stoke Newington, Middlesex. 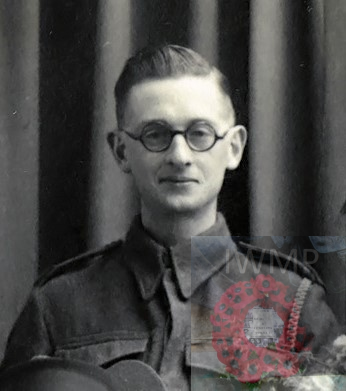 Ernest was a Tailor’s Cutter, and a member of the St. John’s Ambulance Corps – Ipswich Division. He was living with his parents, sister and nephew at the family home – 12, Woodville Road, Ipswich. Harry, a Watch, Clock & Jewellery Dealer & Repairer. Violet Bertha Threadkell (nee Cole), born October 1907, Ipswich. and Ernest’s 3 year old nephew. In 1940, Ernest married Lucy Norfolk, born August 1911, Hill Cottages, Wash Bridge Road, Ridgewell, Essex. 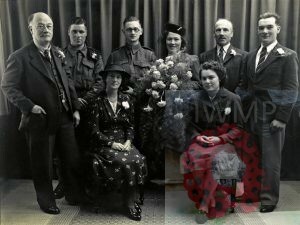 Probate to Lucy Cole – widow & Harry Walter Cole – brother, a Cooperate Accountant. Captured by Japanese: Ernie was on a troop ship bound for Singapore. Unfortunately they were unaware that Singapore had already fallen and were captured on arrival. Lucy then heard nothing for 2 years until news of Ernie’s death finally reached her. The following is what I gathered from my Auntie Mary: His father had a shop in St. Helen’s St., Ipswich (a watchmaker & jeweller). The family lived round the corner in Foxhall Road. Ernie was working for a certain Mr Sneezum, a widower, in his “pawn shop & men’s outfitters” when he met his future wife. They happened to meet because Lucy was also working for Mr Sneezum at his home where she performed domestic duties & was also looking after the widower’s 2 young daughters, Mary & Juliet. Ernie was a St. John Ambulance man often attending football matches, sports events etc. So, when called up, he was assigned to assist a medical officer in the Royal Norfolks. He died a prisoner of the Japanese, from beri beri due to malnutrition. Ernie was my husband Peter’s uncle. Peter’s mother Violet Threadkell (nee Cole was Ernie’s sister. Not only did Violet lose her brother in 1943 but also her husband gunner Victor Threadkell, blown up at sea. Victor too was from Ipswich).